Very Good condition. Preamp works well. No scratches or dings. None - not even the back side. Yet - the back-of-the neck shows real use (I like that) Frets are in good shape, Neck is straight. Came with Epiphone leather strap and aftermarket HSC. Are you gonna try & get the tuners back to their original gold finish? 2007 Epiphone (QingDao) G400 Flame Top-'QingDao Lass' - Too young, but oh so pretty! Marshall G80RCD 80 watt Combo - I just needed some valves! I hope to find a someone who can plate the tuning knobs and bridge back to the original gold look. The only way I could source new ones was to purchase the entire tuning machine and there is no way to find a matching bridge so I'll give plating a shot. 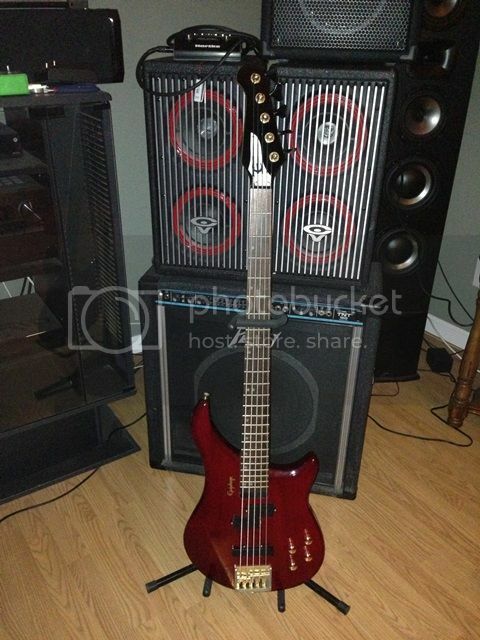 I think I paid a bit much for it but with a case and shipping - sure was more than my other $100 CL basses. I'm pretty sure I contacted you about this bass on another forum, but just to confirm... you got that from Rumble Seat Music in Ithaca, correct? If so, I played it myself and was very interested in going back to buy it. Alas, it was gone. Now I know why! But I have my own now, a 1991 but otherwise the same thing. I will keep it for a few weeks and try gigging with it. I may part with it, if anyone is interested. You can probably find me on that other really popular bass forum with the same user name and a picture of Darth Vader's voice. I'm also on Google+ and have posted it on several other bass communities there. The guitarist detuned one of my strings and he won't tell me which one! me to and im restoring my factory circuit board little by little. well, I replaced the 3 micro switches but the pots I ordered won't work and these were the closest I could find to stock so it looks like I will just have to get some cleaner and try that, problem is I hear a lot about deoxit but not which one to use, I know d100 for metal contacts and fader one for carbon and plastic traces and not really sure exactly which are on the EBM5. looks like metal fingers but the trace looks like it might actually be carbon so do I use the D100 or the fader deoxit? or should I just go with my old standby of either QD electronic cleaner and 91% rubbing alchohol?. other than the pots though I have her done and she plays but she seems a little more trebly than my Ibanez 4 string through my old peavey TKO 65 ( might just be me though). Mine was destined to become a wall hanging as it was darn near impossible to keep the neck straight and true. Luckily I was pointed in the right direction and a local guy repaired it back, good as new. I picked up an EBM-5 in black a few months ago at a Pawn shop in Toronto they had a $329.00 tag on it but I was able to talk the owner's daughter down to $110.00 they didn't know about the active Pups and only needed a new battery. My hardware polished up pretty good with Gibson's Vintage Reissue Restoration Kit. Remove the back cover and carefully examine all the electrolytic's look for any "weeping" (tiny traces of liquid) if you see any change the capacitors as soon as you can. If you find the pickup balance or hear a hissing which decays a few seconds after plugging it in thats a fairly sure sign they need replacing. I did mine and the results are amazing for such a simple quick fix.